Yesterday was my first foray into The Crowd, formerly known as Green Mondays. It was a little disappointing but back to that later. I decided to go because it was based on the subject that I find rather interesting which, if we can find a way to harness it, can actually help us move forward faster than we are now. For me, moving forward means the creation of a world in which it’s not ridiculous to consider taking care of the planet and the people in it as a ludicrous prospect. Anna Simpson of Green Futures Magazine and author of The Brand Stategist’s Guide to Desire moderated our discussion which I found to be somewhat more stimulating than sitting in my office staring at spreadsheets. 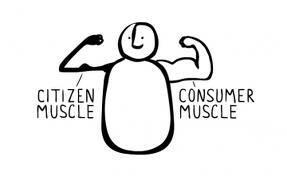 The world as it currently is, which is a rather recent development, treats people as consumers. And as consumers, we don’t really participate in life anymore. We trust brands to make decisions for us and assume they will do the right thing. However, as we see on a daily basis, a brand’s only loyalty is to shareholders. No matter what they do, the idea is to extract as much money from you over as long a period of time as possible. As consumers, that’s the devilish pact we have made, yet we wonder why things do not change, why there is so much injustice, why people feel powerless to do anything about anything. We have let brands invade our lives to such an extent that we are paralyzed when it comes to making decisions whether that’s about important things – like buying an engagement ring (brand invention) or more everyday aspects (do I subscribe to sky tv or feed my family better food?) OK, not so trivial. There are so many themes that come out of this area. Havng scanned some pages of Anna’s book, it does look like an interesting read. I may actually get a copy for one of my friends who works in this space – more in innovation though. One of my questions: do we want brands to play such a dominant role in our lives? The reason that they are able to now is because we (generally) have been encouraged to not ask any questions and have accepted our role as mere consumers – to the detriment of our own health, our bank balances and even relationships. To start a new narrative means rethinking the role of brands. We look to them for solutions to our lives when really we should be looking for those solutions ourselves and using these products to enhance our lives. Yes I know, I’m too idealistic but someone needs to be. In the book, Anna writes about collaborative consumption as a break from the mould of traditional consumerism which is correct. Yet if we measure the success of Zipcar, Air BnB and others in the same way we have measured the success of BMW and Continental Hotels, then we will surely end up in the same space? The way and the amount we consume is not limited to the brilliant marketing strategies of brands, it’s intrinsically linked to the way we measure success. Success equals profit at all costs. And I assure you, there are many companies that don’t give a damn about sustainability/CSR/saving animals/or even looking after their grandchildren. So if we want a real lasting change, we need to change the entire system, not just the consumption zone. Which we can’t really talk about in polite company because it’s akin to blasphemy. Asking people to get involved in life once again is not a bad thing. In fact for our own well being, emotional and physical, there is something to be said for reconnecting people and reminding us what it is to be a citizen. To participate in everyday life, to question the decisions that are made which skew the way the world operates, to delve into the incredibly fountain of knowledge that exists at our fingertips to make informed decisions,these are not new traits but the are traits that are worth rekindling. Referring to people as citizens creates a different mindset, this was something that Irenie Ekkeshis of the New Citizenship Project confirmed when she spoke of the survey they conducted with 1000 people. 500 people had the word citizen in the title question, while the other 500 had consumer. People reacted differently according to title. We know that things are not right and we would love to be part of the solution in whatever way we can, but we have to feel that we can have those conversations that allow us to participate, to be listened to, to act and if necessary to dissent. Being a citizen is about making informed decisions, about questioning our lives and coming to our own conclusions. After that, then by all means, give me a brand that will help me be a better me. The Crowd – Time to spice things up. Get some of the pioneers together with the old guard and let’s see what they have to say to each other. Ikea, Kingfisher etc… are looking for innovations but are they looking in the right places? Do they know where to look and are they willing to help others do what they might not be able to accomplish? It’s been years of back slapping and philosophizing but the rhetoric remains the same. Let’s see you guys change things up and introduce the innovators to the Crowd. Thanks for sharing your views – its always interesting hearing about people’s evenings. We’re up for spicing things up, and your suggestion is interesting. That’s basically the principle behind our Going Naked format, and its a reminder that we should do more. What’s your name & twitter handle, so we can respond publicly? Hi Jim – thanks for reading.